FULTON, NY – Following an intergalactic inspiration Oswego County Opportunities has chosen the perfect date for its annual Bowl-A-Fun…May 4. Planning committee members are preparing for an intergalactic experience at this year’s OCO Intergalactic Bowl-A-Fun! to be held May 4. Kneeling from left are Betsy Copps and Christine Prevost. Standing from left are Candra McFarland-Gawarecki, Colette Nellis and Bridget Dolbear. 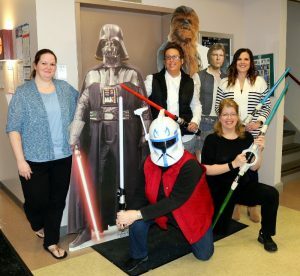 In recognition of May the fourth, OCO’s Bowl-A-Fun will feature an intergalactic theme. One of Oswego County’s most anticipated spring events, OCO’s Bowl-A-Fun is a family friendly event that promises to be great time for both bowlers and spectators. Joining G & C Foods in supporting OCO’s Bowl-A-Fun are Silver Level Sponsors The Shineman Foundation, Community Bank, and Glider Oil. While intergalactic space may be infinite, space for teams in OCO’s Bowl-A-Fun is limited and will be filled on a first come, first served basis. For information on team registration, pledges, and donations/sponsorships visit www.oco.org.